If you know me personally, you'd know that I absolutely LOVE Korean BBQ. As an Asian-American living in Southern California, it's a pretty normal thing for me. Almost every single day there is someone I know out eating Kbbq, so when I got the opportunity to attend a media event that Moodaepo Rowland Heights was hosting, I was beyond excited! A few other bloggers and yelpers, along with myself, were invited to this event (hosted by Wendy of Wendyful World I might add) to try Moodaepo's new lunch menu and Korean Bbq. This was my first media event, so I was very excited to meet up with some other bloggers through SoCal Lady Bloggers. I was very happy to sit with Allison from Girl with the Pink Snuggie, Julie from Wrongway Peachfuzz, and Jess from IRockSoWhat. It was lots of fun sitting with them and getting to know them through the beauty that I call Korean Bbq. 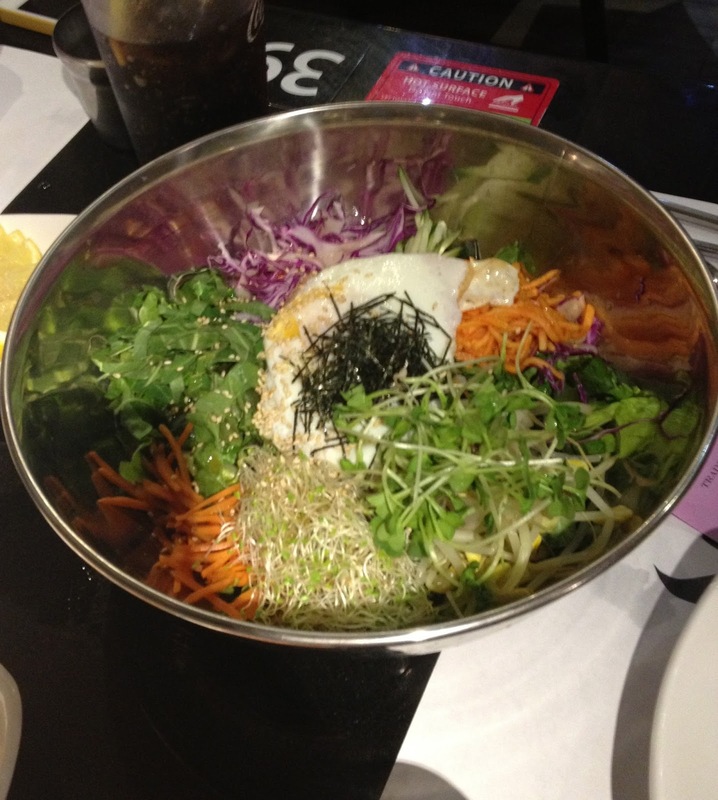 First, we started off with a traditional Korean Salad, called Saesak Bibimbap. The salad consisted of a fried egg, bean sprouts, seaweed, carrots, and other assorted spring veggies! It was pretty good, but I'm not much of a salad person so I didn't eat much of it. 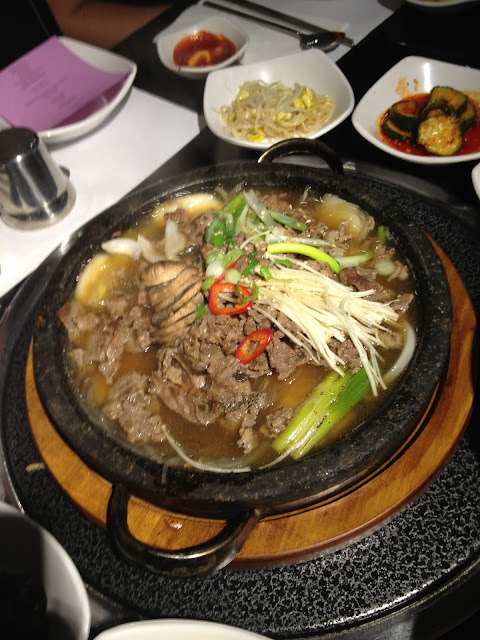 Next, we were served the Yuksu Bulgogi, which is Bulgogi Soup with Rice Cakes and Vegetables. I actually really liked this dish and ate it with Sriracha. Yum! The meat was beef and having mushrooms in the dish reminded me a little bit of Mongolian Bbq (which I also love!). I definitely ate a lot of this. 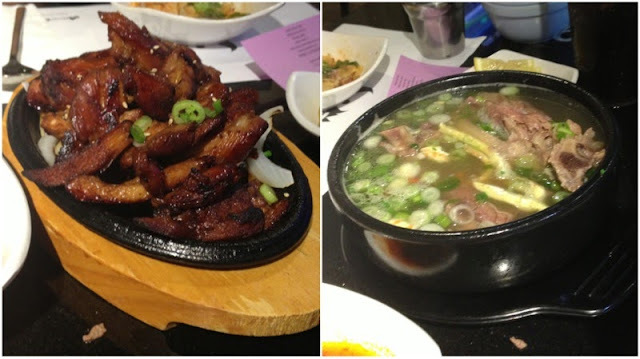 Shortly after eating the Yuksu Bulgogi, we were served the Teriyaki Chicken and the Galbi Tang, or Beef Rib Soup. Boy, I must tell you that the teriyaki chicken was some of the best that I've ever had! Teriyaki chicken is such a common dish, but Moodaepo did a great job at making it stand out tastefully (to me, at least!). As for the Beef Rib Soup, I enjoyed it mostly because I love all kinds of Asian soups. It reminded me of some Filipino stews as well. I know for a fact that Allison enjoyed this as well! She kept eating it, even after we had gotten the Korean Bbq! Up Next, was a dish that I had been waiting for the entire meal! (No, not the Korean Bbq yet!) It was the Kimchi Fried Rice, or as it is traditionally called, Kimchi Bokumbap. 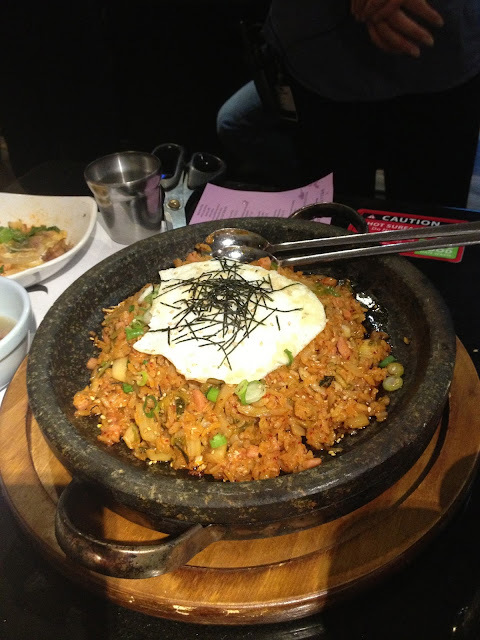 Kimchi Bokumbap: Kimchi Fried Rice! It's rice. I'm Asian. That's pretty obvious. After going to college and being deprived of Asian food, I learned to appreciate rice so much more! I normally don't like fermented food, but the kimchi (which is fermented cabbage) adds a very interesting flavor to the rice, which I actually really like. So after eating all of this food, you'd think I'd be full, right? Well to put it simply, no! I was actually still really hungry despite having had a whole meal already. 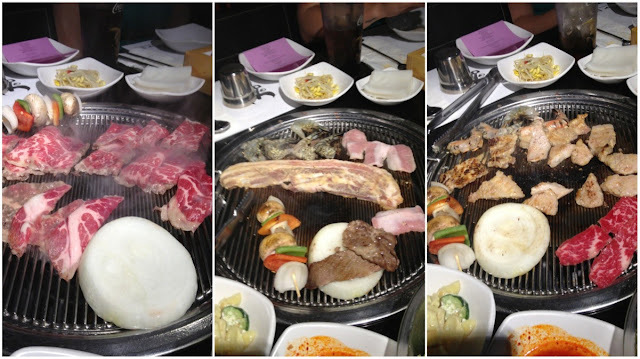 But after all of these dishes, we finally had what we came there for--the Korean Bbq! According to the menu, we were served the Prime Beef Brisket, Prime Marinated Short Ribs, Flower Steak, Tiger Shrimp, Prime Pork Cheek, and the Miso Pork Belly. Out of all of them, I loved the Prime Marinated Short Ribs and the ever popular Beef Brisket the best. 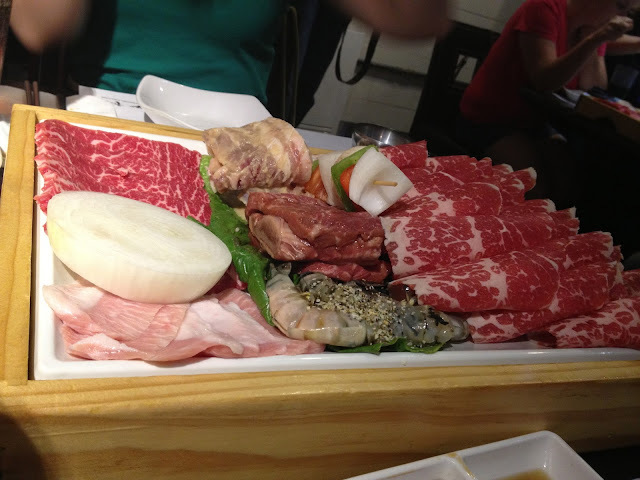 However, I did enjoy all of the meats. I found the Flower Steak and Pork Cheek interesting because it was my first time having both. But it was a good kind of interesting and wished that we could've had more. Another thing that I loved with the meats were the sauces! They had the brisket sauce and salt/oil mixture that most Kbbq places have, and when I asked for hot sauce, the servers gave us each a small dish of a special hot sauce that they serve. I must say that it was definitely different than what you normally get for hot sauces, but I liked it for the most part. Look at all those beautiful meats on the grill. Yum. Would I come here again? Heck yes I would! I'd be willing to drive here every now and then, and I also have friends who live in the area so it would be great to drive up and hang out with them here when I visit. I think that it is well worth the drive. The food is great, the service is great, and the atmosphere of the restaurant itself is really hip and modern. I would definitely recommend this place to anyone who asked! If you'd like more information, "like" MooDaePo RH on Facebook! Disclosure: I was not paid to write this post, but I was served this food for review purposes. All opinions are completely my own. and you are making me SOOOO hungry. I am the biggest teriaki chicken fan ever. I am now running to the store to buy stir fry ingredients for dinner. Kriselle, thank you for sharing your wonderful experience! You are an amazing writer! Love all the photos, too!